Here is what I faxed today to USPTO Director Michelle Lee about the ever-increasing backlog of PPH petitions. Using an RCD to try to defeat a US design patent? In general can a Registered Community Design be cited as prior art to counter a claim of design patent infringement of an issued US design patent in the US? Do you know of a case that says that? Here’s what I think. And I hope that readers will offer their own comments. We will all be affected by the inevitable growth of OTT (over-the-top) distribution of entertainment, both as intellectual property practitioners serving clients and as consumers watching the stuff. A Nielsen report from May of 2014 says that in 2013 the average American household got 189 channels from their cable television or satellite television provider, and actually watched only 17 channels. One way to look at this is that in 2013, the cable or satellite provider bundled about 112 channels that you didn’t want along with the 17 channels that you did want. “Over-the-top” or OTT is the effort by some content providers to bypass the cable and satellite television providers and to reach consumers directly. I’ll discuss some of the OTT initiatives. 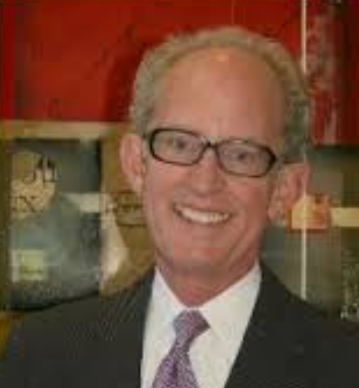 US trademark practitioners are just now starting to get asked by foreign clients to do a ki nd of filing that never existed before about September of 2014. The filing is a ten-year Statement of Use for a US Madrid registration. This blog article tries to explain such filings and how they are similar to and different from other US trademark maintenance and renewal filings. If you already understand everything about the figure at right, you can skip reading this blog article! Can a US design application still be filed? A design was disclosed in May 2014, with a registration granted December 2014 in The European Community based on an application filed towards the end of October 2014 (within the last six months). Is it still possible to file a design application in the US? Does the statutory bar for design patents run one year or six months from initial disclosure? Can a US design application still be filed within six months of priority, even though the priority application has already been registered? The questions remind us that Article 4 of the Paris Convention sets a twelve-month period for filing a second patent application that was intended to claim priority from a first patent application, but that the twelve-month period applies only to utility patents, not (US) design patents. For design filings, Article 4 sets a six-month period. When we do the mental gear change from utility to design, there is the number “six” that pops up in our heads as well as the notion that the number “twelve” no longer applies. The questions remind us that before the America Invents Act (AIA) happened, there was a twelve-month grace period. You could disclose your invention 11 months ago, and file your US patent application, and it was no problem. Indeed a third party could independently invent the same invention 11 months ago, and disclose it 11 months ago, and still even that disclosure did not have to be a problem. You would merely “swear behind” the activity of the third party and the problem would go away. By this we mean establishing that your date of invention predated the third-party disclosure that happened 11 months ago. So the listserv member may have been wondering, does the “twelve becomes six” change from utility to design (in Article 4 of the Paris Convention) make a difference in this fact pattern? But probably the main thing troubling the listserv member was the AIA itself, which sort of eliminated the twelve-month grace period and sort of did not eliminate it. Still another thing that the listserv member may have been thinking about is (pre-AIA) 35 USC § 102(d) that says that if a foreign filing resulted in a foreign patent issuing before the US filing date, then under certain circumstances the US filing is statutorily barred. Here we have a granted design registration in OHIM that would be chronologically prior to the proposed US design patent filing date. Is it a statutory bar? If you’d like to test yourself, work out what you think the answer is, and then read on. Today was Design Day 2015 at the USPTO. From humble beginnings many years ago, Design Day has grown to an enormous all-day event, filling both halves of the USPTO auditorium and overflowing to computer screens in streamed offsite locations. The in-person attendees numbered some 320, of which about one hundred were examiners in Technology Center 2900 (examiners who examine design patent applications). These days of course at any design patent event, one faces the spectacle of the many, many patent practitioners who used to pooh-pooh design patents as a waste of time and who now will proclaim (with no apparent embarrassment) to anyone who will listen how much design expertise they say they have accumulated over the years. As I mingled with the attendees during the break times in t his all-day meeting, I was reminded that there are a small handful of practitioners (Perry Saidman comes to mind, but there are others) who were voices in the wilderness, years ago, getting design patents for clients long before it was trendy and fashionable to do so. It was nice to have an opportunity to chat with the design patent examiners, and to learn a bit about what their daily work is like. 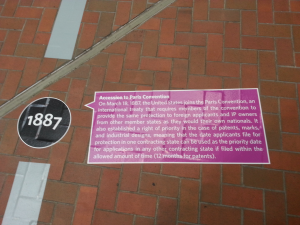 There’s a curious temporary display in the atrium at the USPTO. 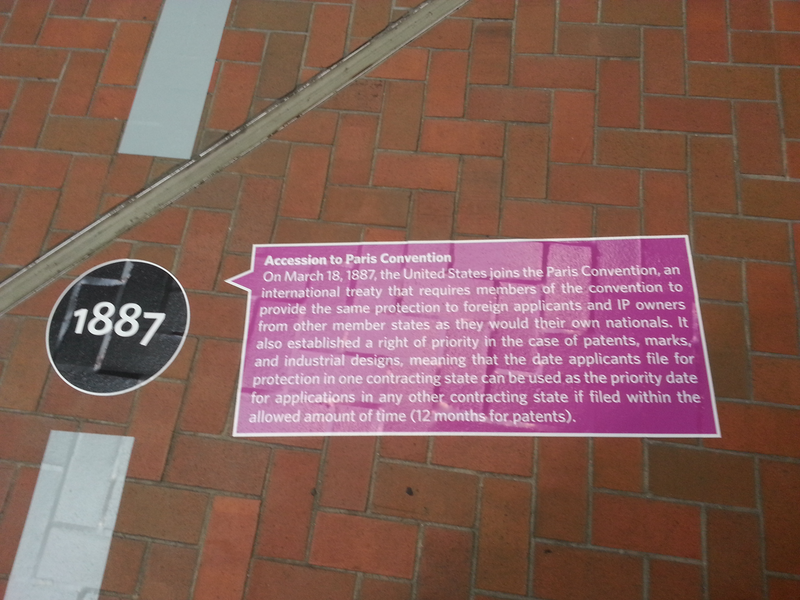 Called “Walk through time”, it is a winding path with large printed labels on the floor, portraying various events in the history of the USPTO. It starts with the founding of the patent office and proceeds through some sixty or so events to the present. My personal favorites are the 1887 event (the US joins the Paris Convention) and the 1970 event (the US joins the Patent Cooperation Treaty). 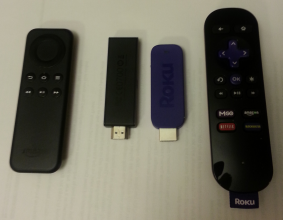 We’re all familiar with media sticks such as the Amazon Fire TV Stick (left) and the Roku Stick (right) and the Google Chromecast (not shown). You plug the stick into a spare HDMI port on your television, explain to the stick how to connect to your wifi, and sit back and watch any of a range of “over-the-top” programming. This “over-the-top” programming, by the way, is going to change everything for those entertainment providers (DirecTV, Dish, Comcast cable TV, Time-Warner cable TV) that traditionally made big profits by forcing you to buy expensive bundles of channels just to get the one or two channels that you actually wanted. But the new world of “over-the-top” programming will be the subject of a later posting. For now, the important thing is that one of these media sticks just got better, and is now the ideal media stick for the road warrior who wants to watch the occasional movie-on-demand or television-episode-on-demand while on the road in a hotel. The big problem, until today, with all of these media sticks was that they won’t work worth a darn in a hotel. The hotel wifi nearly always has a “terms and conditions” screen that you must view and click on to gain access to the hotel’s wifi. Or requires that you enter your room number and name as part of gaining access. And the media sticks lacked any way to do this. The media sticks are programmed to update themselves with the maker’s latest firmware. And today’s firmware update for one of these media sticks gave it the ability to connect in a hotel. Which media stick, you might wonder, am I talking about? It’s fascinating to see the USPTO correcting its mistake in a recent acknowledgment of an incontestability claim in a trademark registration. Law Professor Rebecca Tushnet (Georgetown Law School) has a fascinating blog called Rebecca Tushnet’s 43(B)log with a tagline of “False advertising and more”. If you haven’t subscribed to her blog, you should. 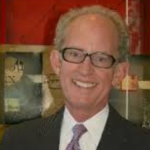 One of her blog posts today is No dog in this fight: PTO makes a cancelled mark incontestable. The story told by this posting is by turns amusing, puzzling, and astonishing as one reads about the manner in which the USPTO handled the underlying trademark application and registration.